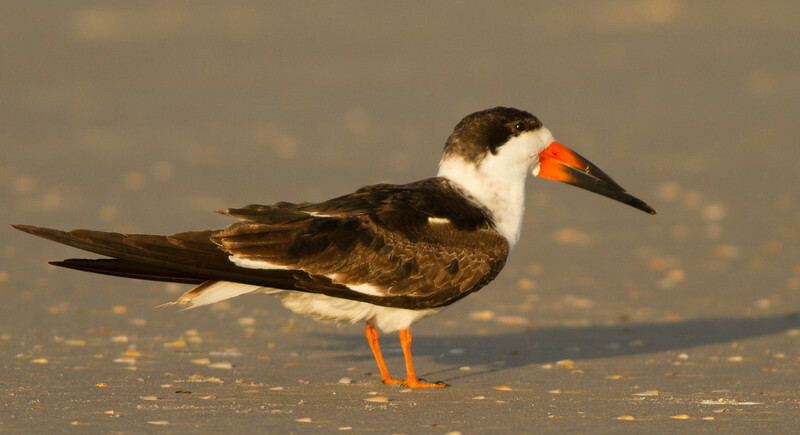 The last couple times I've visited Ponce Inlet near Daytona Beach, FL, I've been greeted by upwards of 100 Black Skimmers. 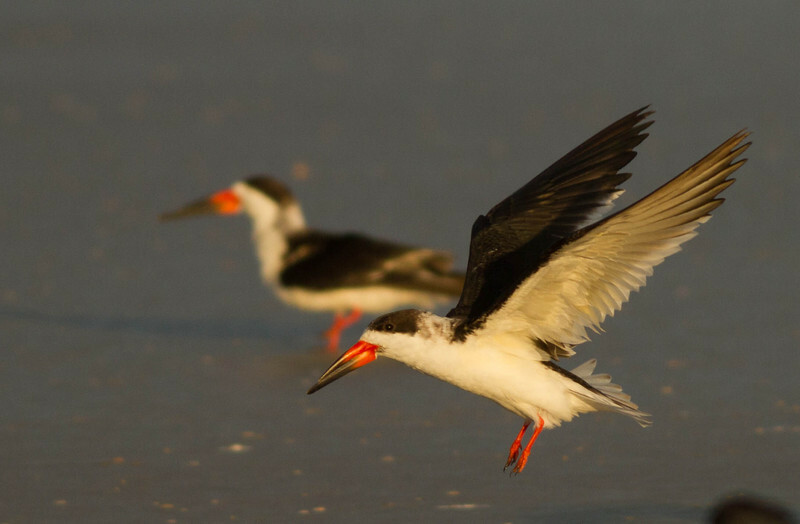 These wonderful creatures are unique in the bird world--check out their bills. 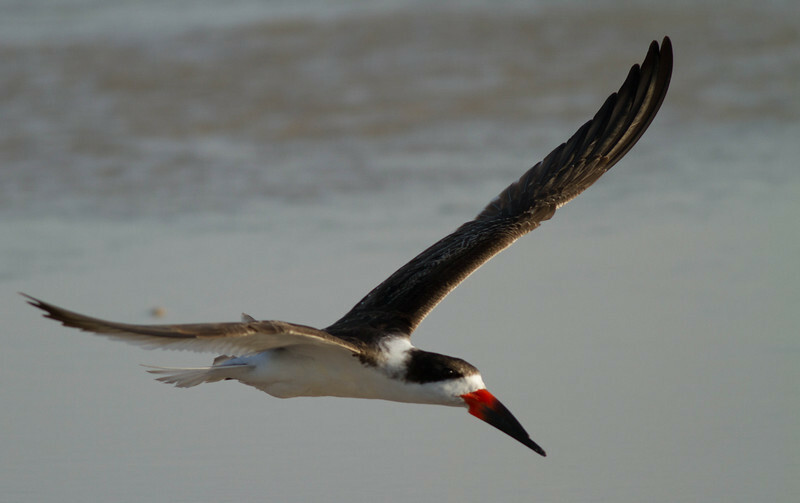 They're the only American bird where the lower mandible is longer than the upper mandible. Look at the bird from the side, and the bill seems rather thick, but from the front the bill is razor thin. Even more fun is their unique feeding style. 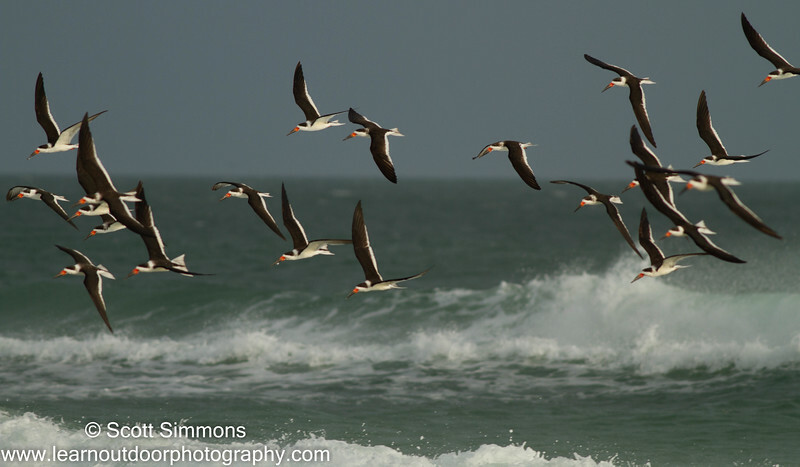 They fly low over the water and skim the water with their bills in search of small fish. The lower mandible slices through the water, and when it gets a fish, the upper mandible closes down on the fish to capture it. I like to see them when they're resting. They rest their heads on the sand, and it looks like they've tuckered themselves out so much they can't hold up their bills anymore. 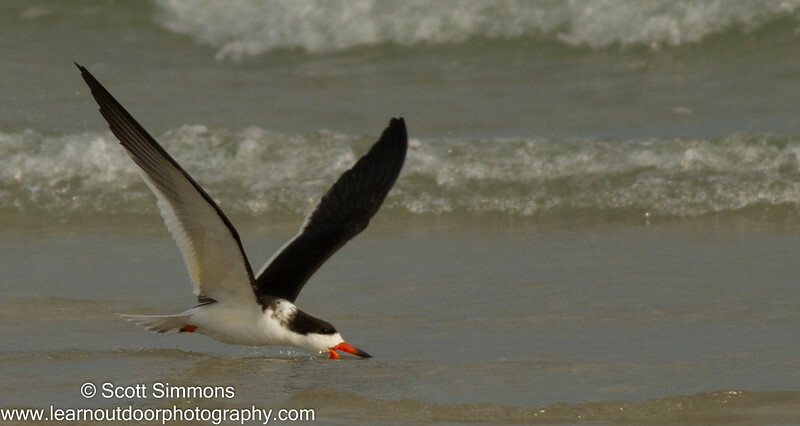 Black Skimmers are related to Gulls and Terns. They average about 18 inches in length and have a wingspan of about 44 inches. I love capturing images of them in flight. UPDATE: Heidi noticed in a comment below that one of the birds in the photo above has a fish hook lodged in its throat. 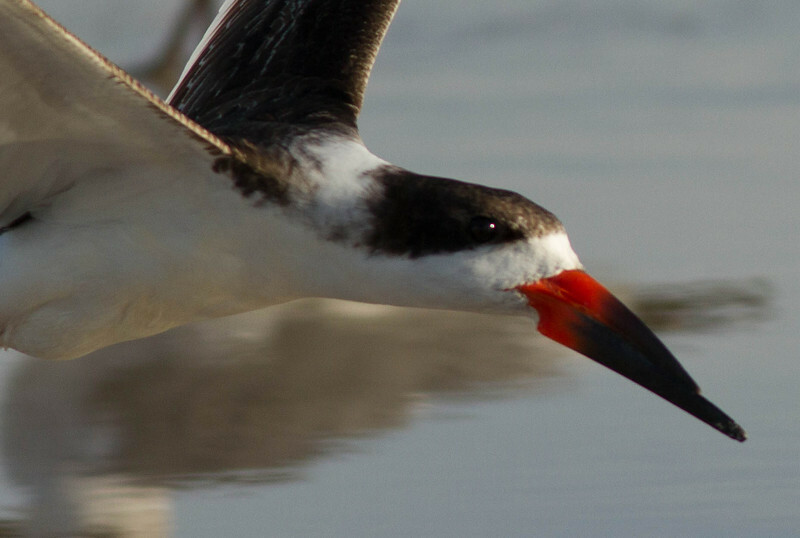 Here's a cropped image showing the bird. When the wind is blowing, look for them to be lined up facing into the wind. Great photos Scott!! 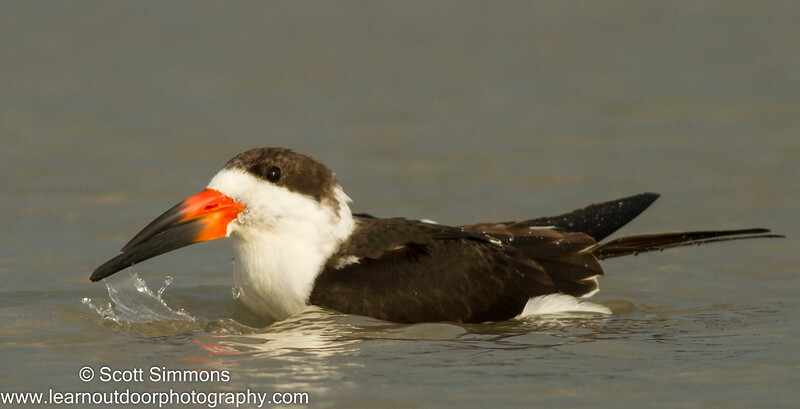 Skimmers are such cool birds! Super shots Scott, and such a great subject! Thanks, Laurence! 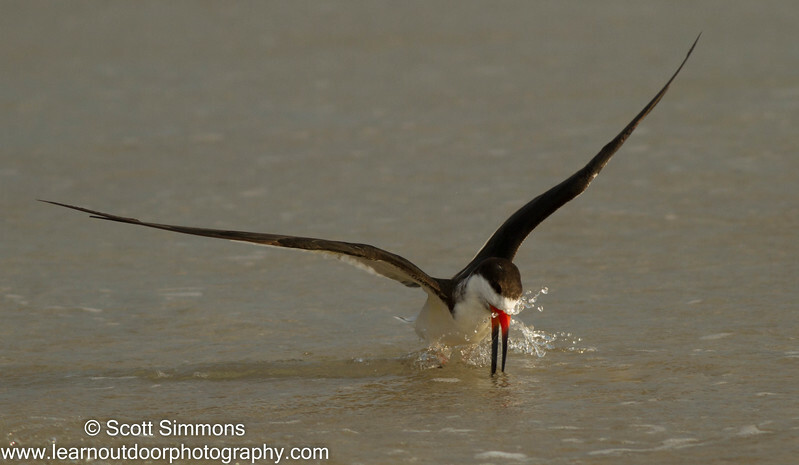 The skimmers here have put on quite a show here recently. 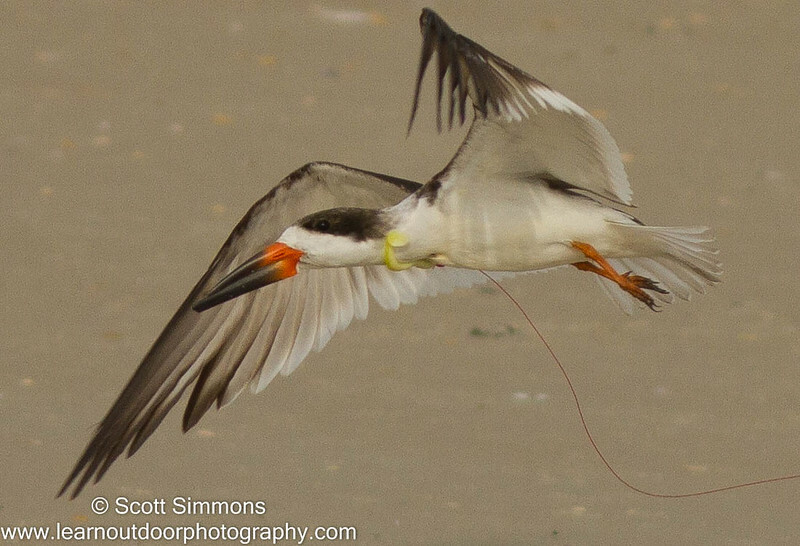 ....so in the photo below the bird resting on sand, is that fishing line hanging from the lowest bird??? Yes it is. I can't believe I didn't notice that. The rubber worm is still attached to the hook, and the hook is lodged in its neck. That's now the second bird I found that day that was hooked by fishing line (I have a photo of a hooked Double-crested Cormorant that I found that day too). There are many fishermen there, and while I'm sure most are very responsible with their fishing lines, it really bugs me to see this. I'll add a cropped photo of the bird above, since I can't attach an image to a comment here. ...great post. I love these birds. I only get to see them when I head to Florida, though, which is never enough! Wonderful post Scott. So sorry to see the bird with the fishing gear attached to it. 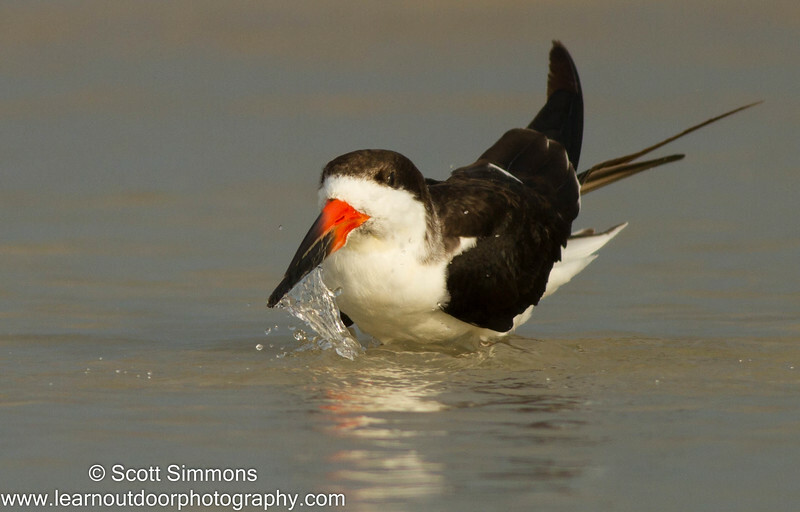 Fishing line and hooks are a big problem because they can kill birds and other wildlife. Love the flight images. Terrific post, Scott! 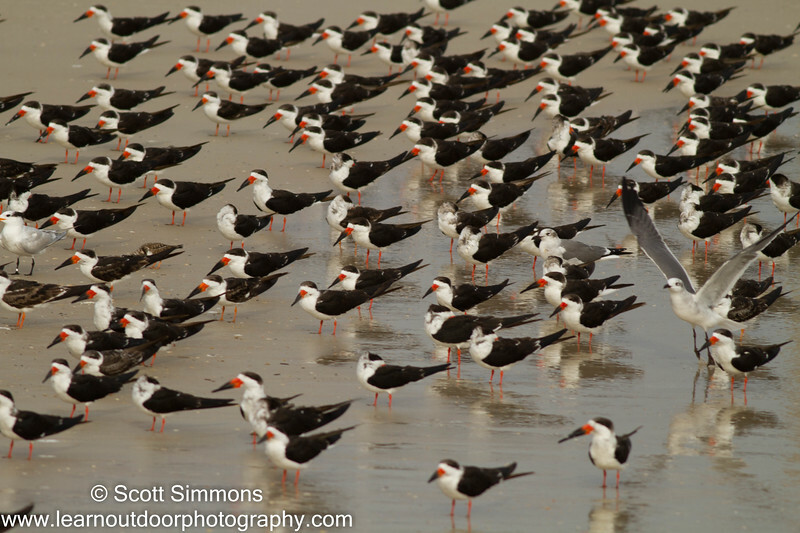 I have had the pleasure of viewing these cool birds while vacationing in Florida. I missed seeing them this year, so it's especially enjoyable for me to view this post. Fantastic photographs, especially the feeding and in-flight captures! Fantastic shots of an outstanding bird! How sad about the bird with the fish hook! 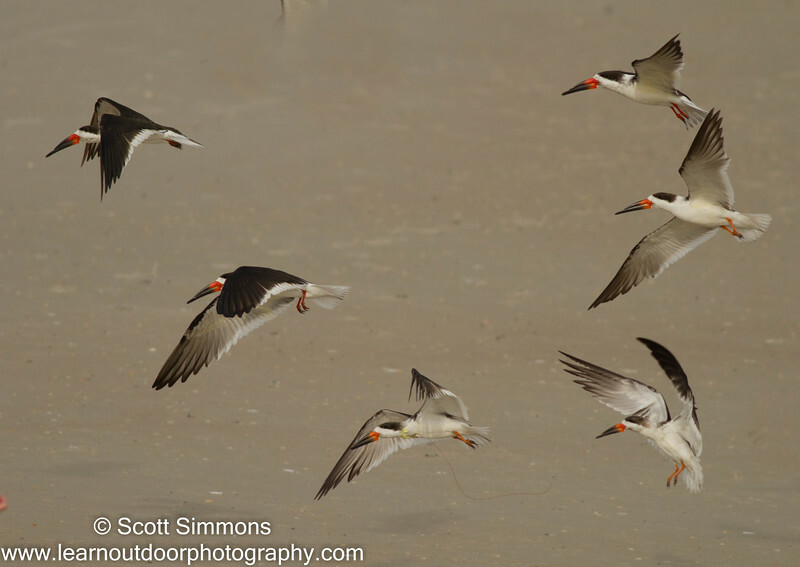 The best images of Black Skimmers that I have ever seen, Scott!